Citroen C3 Performance, Engine, Ride, Handling | What Car? There are five engines in the C3 range, but so far we’ve only driven three of them: these are the three-cylinder 1.2-litre Puretech petrol engines, in outputs of 81bhp and 109bhp, and the 1.6-litre BlueHDI diesel with 99bhp. The lower-power version feels fine for pottering around town, but on the motorway it starts to run out of puff. To make any decent progress, you’ll need to rev it very hard. As it doesn’t come with start/stop technology like the 109bhp Puretech, you do feel vibrations through the seat and steering wheel when you’re stationary. So if you regularly travel the highways and byways outside the city, we’d recommend plumping for the 109bhp model. Although at its core this is basically the same engine as above, a turbocharger adds a bundle of helpful extra pace. Not only is it punchier on all roads, its extra performance is available from much lower revs, making it considerably more relaxing to drive. As for the diesel, it has plenty of power that makes getting up to speed and staying there easy. It does send quite a lot of vibration though the controls at idle and you’re always aware that it’s a diesel, though. Considering the high purchase price, we’d avoid unless you do an awful lot of miles. 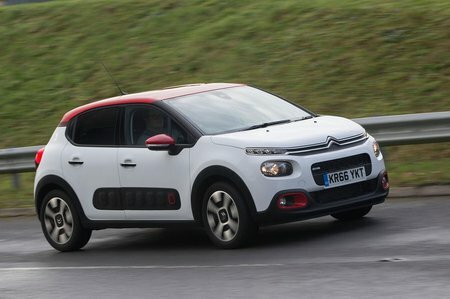 Citroën has gone soft with the C3, giving its wheels plenty of room to move in the wheel arches and making the suspension squidgy. As a result you’d expect it to be pretty compliant, which it is. It lollops over general bumps like a Silver Cross perambulator, but just as baby will know, that’s not as comfortable as it sounds. Because the body control is so loose, it’s always moving around, even over small undulations. It’s the same story over sleeping policemen, with the suspension absorbing the initial bump well, but subsequently letting the car slam back down in an uncontrolled and uncomfortable way. And all that’s before you’ve even entered a corner, where you and your passengers will be swayed about by the extensive body lean. Drive a C3 back-to-back with Ford Fiesta, or even the Skoda Fabia, and you’ll immediately feel better body control equals less jiggle, which in turn equals a more comfortable ride. 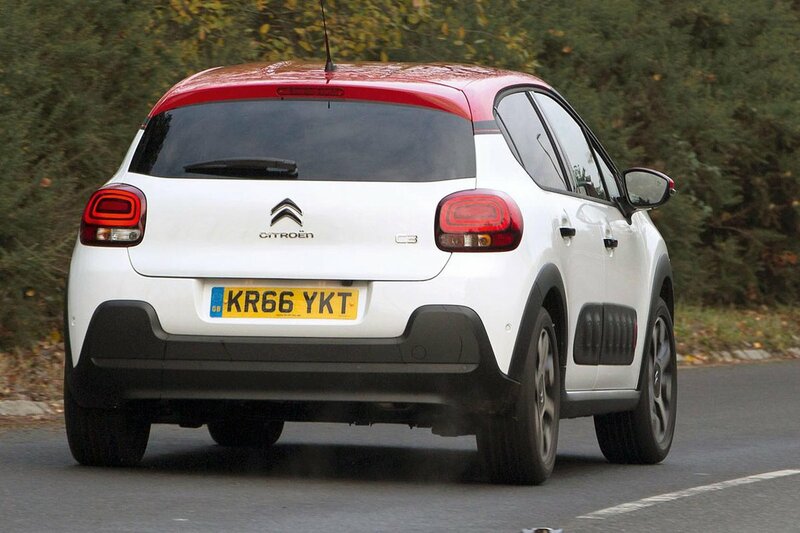 The C3 doesn’t really 'handle', in the way we’ve come to expect from modern, nimble small cars. In fact it feels rather more old-fashioned than its sharp looks would suggest, with huge amounts of body roll through corners and very little feedback to let you know what’s going on underneath. This includes the steering. While it’s relatively accurate, it has precious little consistency in the way it’s weighted. That might not sound important to you, but it means you have to concentrate more on placing the nose of the car in corners, or gauging what grip you have available; on a long drive through the country that gets quite tiring. The best handling cars in the class, such as the Fiesta and Renault Clio, are far less taxing to drive. The C3’s petrol engines tend to be quite thrummy, but no more so than rivals with three-cylinder engines. It’s not an unpleasant noise, but it’s something you are more aware of in the lower-power versions such as the 81bhp model, because they need to be worked harder. The low-end grunt of the 109bhp petrol makes it feel a lot less strained, and generally quieter as a result. On the motorway all the models we’ve tried suffer from the lack of a tall sixth gear, when the engine’s constant buzzing can get a little wearing. Otherwise, at speed wind and tyre noise in the C3 are no more voluble than in its best rivals. Where it comes in for heavy criticism is the control weights. For example, the brake and clutch pedals aren’t very positive, so judging your inputs to be smooth in town traffic is a dark art. And compared to the Fiesta’s light and precise gearbox, the woolly, long-throw gear change in the C3 feels more akin to stirring an old tin of emulsion.